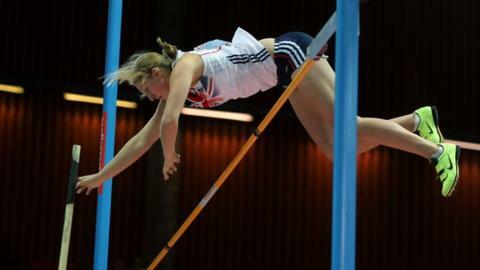 Pole vaulter Holly Bleasdale won Great Britain's first gold medal of the European Indoor Championships with a winning height of 4.67m. The 21-year-old beat Poland's Anna Rogowska in a jump-off after both athletes failed to clear 4.72m. "We could either take the gold together or keep on jumping and I wanted to keep on jumping," she told BBC Sport. "I'm so happy to be the gold medallist." James Dasaolu (6.48s) won silver in the 60m behind France's Jimmy Vicaut. "I knew it was going to be tough being against the Italian and French guys," Dasaolu told BBC Sport. "I've not watched the race back but I don't think I had the best of reactions. I'm happy with my first senior medal. I didn't expect to run 6.48 seconds. It was tough out there. I just hope this is going to help my 100m time, more than anything else." In the pole vault final, Bleasdale, who finished sixth at London 2012, and Rogowska were clear of the field but failed with their three attempts at 4.72m. They could not be separated on countback and so were given a fourth jump at 4.72m. When both failed again, the bar was moved down to 4.67m and, after the Polish athlete missed her opportunity, Bleasdale sailed over to take gold. "I've never experienced anything like that - I've never done a jump-off before," the Blackburn vaulter told BBC Sport. "It was so much pressure if she cleared it first - but at least I had another go. I was confident." Asked how she would celebrate her victory, Bleasdale added: "My favourite pudding is cheesecake so I think I'm going to find one and eat it all." Jenny Meadows reached the final of the 800m while Perri Shakes-Drayton impressed in the women's 400m - taking the lead from the start and producing a European-best time of 51.03 seconds to also reach the final. In the men's 400m, Nigel Levine, Michael Bingham and Richard Strachan all qualified for the medal race. In his 800m semi-final, Britain's Mukhtar Mohammed strolled over the line ahead of the rest in 1:49.89. However, there was disappointment for Olympic high jump bronze medallist Robbie Grabarz who failed with a hat-trick of attempts at 2.27m and finished sixth. "I think I came in with a lot of pressure on my shoulders and I just didn't enjoy myself," said Grabarz. "I think my performance showed that. "I've just got to come back and put a brave face on. It doesn't matter what anyone's expectations are, mine are always higher. I came to championships to win it. "It's really disappointing for me, but what can I do about it now?"